The Check Engine Light (CEL), also called the Service Engine Soon Light (SES), is a warning light that is part of the On-Board Diagnostics (OBD) systems, which monitors a vehicle’s performance and emissions systems. Engine speed, ignition timing, and fuel mixture are some of the variables that are reviewed. 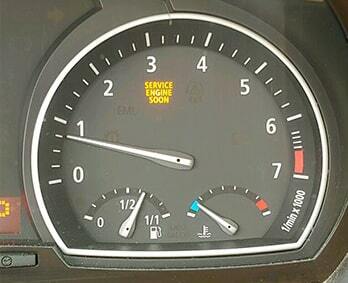 If your BMW Check Engine Light has come on, what should you do? First, scan all of the gauges and make sure that an overheating situation is not occurring. While we should periodically monitor engine temperature, as that’s why the gauge is there, this basic practice isn’t always followed. If the light is blinking, please reduce power and have the vehicle towed as soon as possible. The engine could be misfiring so severely that unburned fuel is being dumped into the exhaust stream, damaging the catalytic converters. Cats are expensive, so you don’t want to shorten their lives prematurely. If a blinking MINI check engine light occurs, drivability will probably be so degraded as to be noticeable. So please cease driving as soon as practicable. If the check engine light is steady, persistently on, it may not be a dire problem, but it’s still a problem. Everything may not be operating optimally as intended. The engine management computer has received one or more signals that something is wrong, and may be adjusting its operating parameters. This could result in reduced performance, increased fuel consumption and higher pollution emissions. Over the past couple of decades, a myth has arisen that all that is needed to diagnose a check engine light, is to hook it up to an automotive diagnostic scanner and an accurate answer will be produced. And now that they’re as cheap as $70, anyone can theoretically diagnose their car and know exactly what’s wrong. If only life were so easy. So, where does the information that the diagnostic computer or scanner receives come from? This information, what are sometimes referred to as trouble codes, comes from sensors. These sensors only know that there is an incorrect reading from a specific component, such as an oxygen or crank position sensor, they don’t know why the reading is incorrect. Is the sensor itself faulty, or is it the wiring, or the engine management computer, or another defect causing an erroneous signal? It could be more than one thing, especially on an older vehicle. The code points in a direction, it doesn’t necessarily provide a definitive answer. This is why skilled technicians, like the factory-trained Level 1 Master Technicians at Pacific Motorsports, are important. They know where to go with the information from the diagnostic computer, and what other factors may be involved, as they’ve probably seen the specific situation previously, perhaps dozens or even hundreds of times before. Expensive modern brand-specific automotive diagnostic computers are a vital part of the diagnostic procedure (and are absolutely critical for coding and updating), but they are but one part. Highly trained and experienced technicians that know what to do, and where to go, with that information, are even more important. This is why our best practices include these key players, so thorough and accurate diagnostics can be performed, and why we here at Pacific Motorsports are your Best Alternative to the Dealer.